Betsoft has announced the launch of their latest Slot3 title and you can try it out for free with a fantastic $10 no deposit bonus. Betsoft has added another new slot to their blockbuster Slots3 collection. This is where you will find true 3D cinematic video slots and the latest release is called The Angler. This new Betsoft slot as you can probably guess is all about fishing and the sea and there are plenty of great features to enjoy. What's more, you can get an exclusive $10 Betsoft no deposit bonus to try it out and we have details towards the end of this article. The Angler is a 5 reel, 20 payline, 3D video slot. It features a main character called Otis who is in search of a legendary catch. The Oyster Pearl scatter symbol in this game will trigger the free spins bonus round and you can get plenty of these too. The Octopus sticky wild is another excellent feature and can be used to replace all other symbols to create big wins. The Octopus also sticks to the reel it's on throughout the free spins round giving players plenty more chances to win. There is a special bonus game too where players get to join Otis on the lake as he tries to catch enormous fish. The more you catch the more you win. 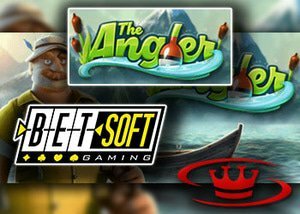 Stephen Jackman, Betsoft's Head of Production Development, said, "The Angler is a fresh, new adventure for the iGaming community. The theme is well-designed, evoking a sense of cool waters and the endless opportunities lurking just below the wind-rippled surface. With the Oyster Pearl scatter feature offering plenty of free spins and a sticky wild that persists through the free spins round, The Angler will have players reeling in the wins in record time." Orient Xpress casino is our recommended choice for Betsoft casino games and right now if you register for a real money account, you can claim our exclusive $10 no deposit bonus using the promo code 10XPRESS. You can use this free cash to try out all the great casino games they have to offer. If you like what you find, you can choose to make your first deposit and claim the Orient Xpress casino bonus which is a first deposit bonus of 100% up to $600. There are also plenty of ongoing promotions that players can avail of and there's a great VIP club too. The no deposit bonus comes with 60x wagering requirements and players can withdraw up to $70. The welcome bonus has wagering requirements of 30x. Be sure to read all the terms and conditions for the no deposit and welcome bonus before you redeem them.